In 2009, deadly Typhoon Morakot caused widespread devastation across Southern Taiwan. The record-breaking heavy rainfall and the worst flooding in Taiwan’s history had caused numerous landslides, debris flows and riverbank breaches, in addition to damaging hundreds of infrastructures. Route 132 in Kaohsiung was also seriously disrupted because of the intense rainfall. It is the only entrance to Maolin District, the world-famous area for purple crow butterflies. Immediate rehabilitation was necessary for the resumption of the normal livelihood of residents and to minimize the losses of benefits derived from local tourism. The project described herein was located at Sta. 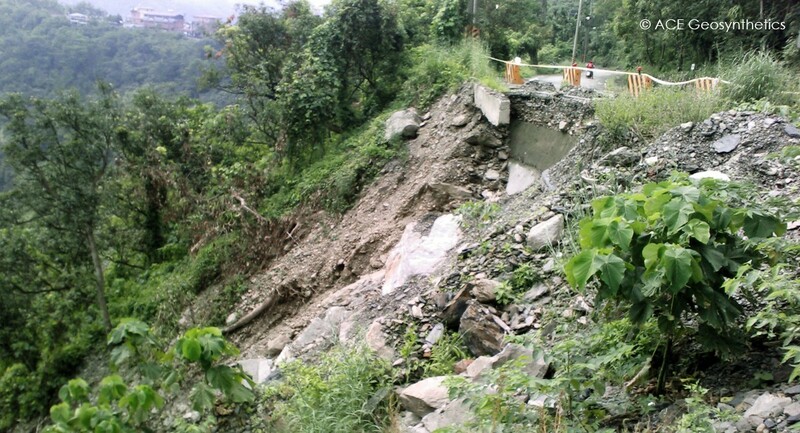 7k+700 of Route 132 where its slope had totally collapsed due to the impact of the torrential rainfall, consequently completely disrupting highway traffic. The depth of the slope was over 20 m and the angle of failure plane was over 70°. 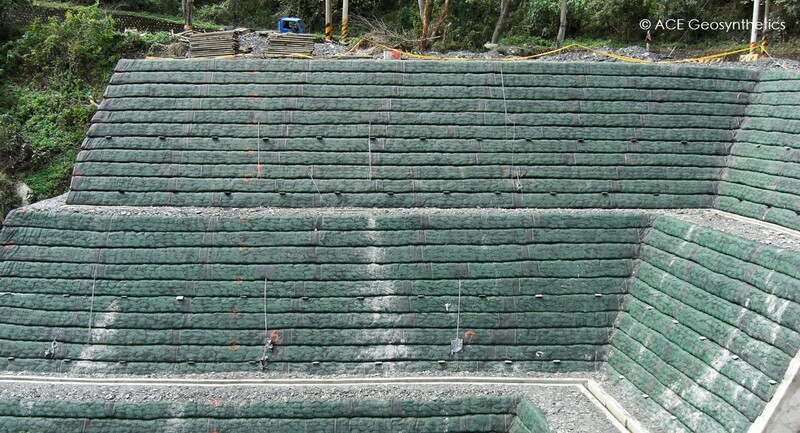 There were tons of rubble on site because of the debris flow and Kaohsiung City Government required that the restoration should be a sustainable solution and use up these materials as much as possible. In addition, the owner also required the construction to be completed within a limited schedule. To build a cast-in-place retaining wall and then backfill in layers with qualified imported materials to the height of the original pavement. 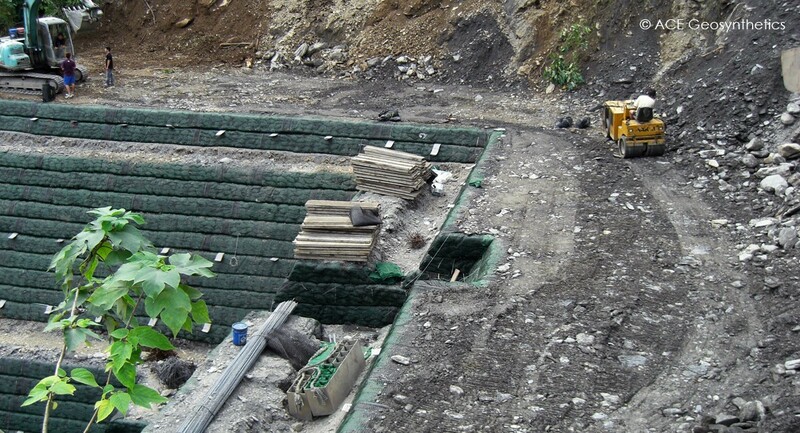 However, pile foundations must be used to support the structure so that it can stand firmly on the steep slope. Such design is costly and takes a longer time to complete. 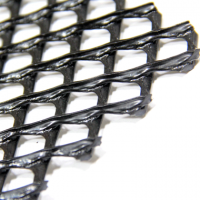 Considering the economical and sustainable issues, the design engineer contracted representatives of ACE and provided ACEGrid® GG150-I and GG100-I as the reinforcing material to build a 4-stage reinforced earth slope (RES) using the collapsed residues on site. 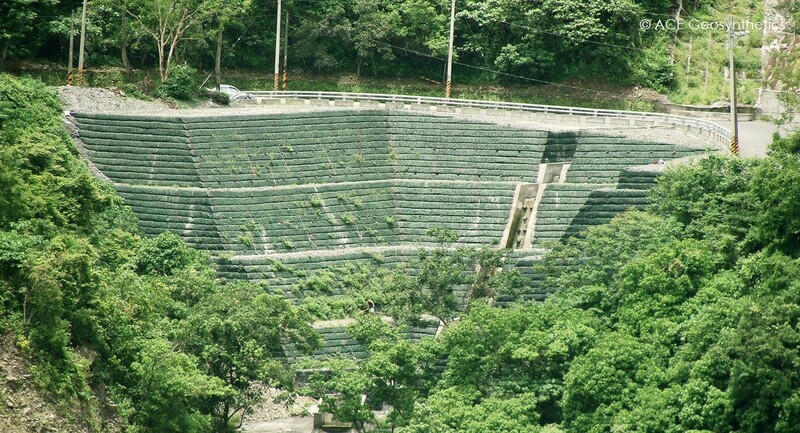 It was constructed with geogrid wrap-around facing with each stage at a height of 5m. 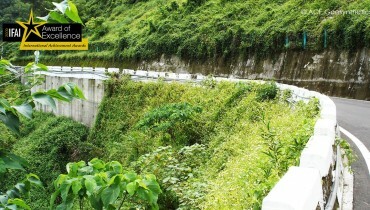 An averaged inclined ratio of 1:2 (H:V) was designed for the RES so that sufficient width of the highway could be maintained. 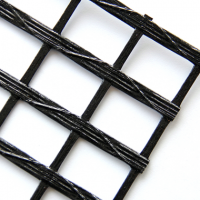 Each layer of the fill material was installed with a vertical spacing of 50 cm. The reinforced earth slope was supported on a 2 m thick reinforced concrete mat. 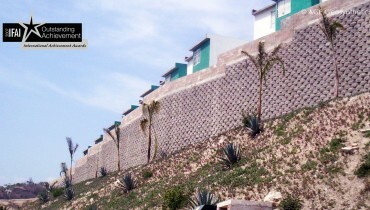 Two layers of stone-filled gabions were placed at the base of the RES to protect its toe against erosion. In addition, longitudinal and horizontal trench systems were installed to facilitate the drainage of surface run-off. Underground intercept trenches and horizontal drains were also arranged for prompt groundwater dissipation. 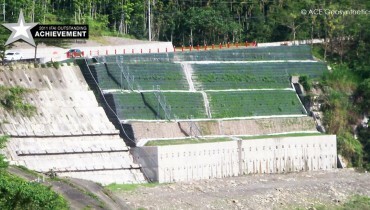 Stacked soil-filled bags were used for slope face protection. They also functioned as the medium of planting as a vegetated slope not only provides an aesthetic appearance, but is also an eco-friendly environment. The completed reinforced earth slope was monitored for stability for over a year with a well-designed instrumentation system. It also has become a favorable place for the overwintering of the purple crow butterflies. The results proved ACE system to be the novel solution required to totally meet the demands of the site.